Acknowledgment: This work has been summarized using the Vintage Books 1961 edition translated by Helen M. Mustard and Charles E. Passage, copyright 1961 (primarily translated from the Karl Lachman German edition revised in 1952 by Eduard Hartl). Quotations are for the most part taken from that work, as are paraphrases of its commentary. Some of the notes derive from various other sources. Overall Impression: This is a charming and richly convoluted tale from the middle ages, well worth a careful reading. Like the minnesang of the era, it deals with the many aspects of love including marital love. It also intermixes the chivalric world of Arthur with the mystical world of the Grail. Notes per the Vintage Books edition: The text was written by the Middle High German poet and Minnesinger Wolfram von Eschenbach, who lived c. 1170 - c. 1220 or 1230. [Minnesingers were poet-composers who thrived in the 12C to 14C and followed the model established by the troubadours and trouvères of France--they were succeeded by the Meistersingers.] He lived at the court of Thuringia (c. 1202 - 1217). Parzival was written probably c. 1197 - 1209/1215. Wolfram was a knight, perhaps poor, and he spent "considerable time at the court of the Landgrave Hermann at the famous Wartburg [castle] near Erfurt" where he met the Minnesinger Walther von der Vogelweide. By legend Wolfram competed in the singing contest said to have been held at the Wartburg and immortalized in the Wagner opera Tannhäuser--though this book's introduction states that "in real life [Wolfram was] very little like the pious baritone who sings the aria to the Evening Star. Wolfram seems to state in the poem that he could not read, and that therefore this was an oral poem. Parzival had a greater scope "than that of any medieval literary work except Dante's Divine Comedy", the two being perhaps the noblest literary achievements of the middle ages. Parzival is a more modern tale however, showing the inner development of the hero Parzival. It treats love in marriage with great tenderness. The Grail circle is not separated from Arthur's world, and these two world's constantly intermingle. Children are portrayed sympathetically, for example Obilot and Loherangrin. The Old German language extended from c. 500 CE to 1000 CE and works in these dialects tended to be utilitarian. But in France the Song of Roland appeared c. 1100 along with a large body of heroic poetry, the "chansons de geste". In the 11C, German transformed into Middle German c. 1000-1500 CE. "Middle High German" developed in the Rhine valley and the southern (higher) regions of Germany and became the dialects chosen for translating the French works. The French work Roman d'Eneas c. 1150 and Estoire (on the Tristan theme) provided models for a newer style of work. Germans produced Oberg's Tristrant und Isolde and Heinrich von Veldeke's Eneit. In 1160 Chrétien [Crestien / Chrestien / Chretien] de Troyes produced poems of Arthurian romances, including Erec (the oldest preserved Arthurian romance, later adapted by Hartmann von Aue), Yvain, as well as Gregorius, etc. His unfinished Li Contes del Graal [written c. 1180, aka Perceval, ou Le Conte du Graal] was the inspiration and main source for Parzival (though Wolfram denies this). It tells the story of Perceval, a tale probably ultimately tracing back to Wales. The Welsh prose romance Peredur (part of the Welsh Mabinogion collection of tales) tells of a hero Peredur (said by Geoffrey to have died c. 580 CE). The oldest copy of Peredur dates to c. 1225 CE, after the time of Wolfram, but probably draws on an unknown Welch prototype that also influenced Chrétien. The alleged source Wolfram names, Kyot of Provençal, has not been identified (he probably is not Guiot de Provins) nor have his works been located--perhaps he is fictional or a joke on the audience. Parzival was written after Gottfried von Strassburg's Tristan and before the anonymous The Song of the Nibelungs, during the early years of the Minnelieder era. The Holy Roman Emperor Frederick Barbarossa had died on a Crusade in 1190--Crusades were in the air. Frederick II was crowned emperor soon after the writing of Parzival and his "conquest" of Jerusalem followed. He was opposed by Pope Innocent III, whose papacy extended 1198-1216. Richard the Lion-Heart was king 1189-1199. German literature declined after 1250 - 1300. King Arthur was traditionally a king c. 500 CE, a Christian Briton who spoke a Celtic tongue and fought against the encroaching heathen Angles, Saxons, and Jutes. By 800 an increasingly elaborate folklore was developing relating to Arthur. Geoffrey of Monmouth wrote Historia regum Britanniae in Latin c. 1135. In it, he glorified the line of British kings from Brutus through Cymbeline and Lear to Arthur and beyond. The Grail evolved from the myth of the Welsh "dyscyl/dysgyl" (a bounteous platter owned by the Fisher King and on which food miraculously appeared). In Old French this was translated "graal" (platter). The same King had a drinking horn ("corn") which provided unending drink and which was translated in French to "cors". For Chrétien, the platter carried a mass-wafer (oiste) for the Fisher King's father. Through an etymological twist, Chrétien's successors said the graal carried "corpus [from cors=body or horn] Christi [from oiste]", and thus the Holy Grail became associated with a known Christian relic, though originally pagan. An anonymous annotator to Chrétien's said the Grail was the vessel which Joseph of Arimathea used to catch Christ's blood at the crucifixion. (This tale is said in the notes to be derived from the 4C apocryphal Gospel of Nicodemus, though I could not find it there) By 1202-1212, Robert de Boron (in Joseph d'Arimathie or Le Roman de l'Estoire dou Graal) declared that the Grail not only was Joseph's cup but was also the very chalice used at the Last Supper. In the prose Lancelot ( 1215-30), the Grail is called the "Sankgreal" ("royal blood") and it is called the Saint Graal in the sequel.. Wagner accepted that it was a chalice, though Wolfram considers it still a stone. The geography of this book is confused (see also specific notes in the summary below). Wales and France seem to intermingle. Karidoel is now called Carlisle, a castle at the English-Scottish border. Bertane (Brittany) has as its capital Nantes, Brittany and Britain are often confused, the English Channel does not seem to exist, and many of the other places in the story were originally placed in Wales. Munsalvaesche was placed in NW Wales (Gwynedd), the Dinas Bran in the Mabinogion. Parzival was published in print in 1477. Eventually, it was shunned by Northern Protestants and after knighthood had become anachronistic. It was revived in the 18C in part due to rising nationalism, and Wagner used it as the primary source of his opera libretto Parsifal, but the libretto is "pretentiously moralizing...wholly alien in spirit to the work it professes to dramatize". From Ernest Newman The Wagner Operas: This is the masterpiece of German mediaeval poetry. There is no indication in the book of the Grail's association with a chalice or the Cup of the Last Supper, the blood of the Savior, or with Joseph of Arimathea. The spear is not the weapon used by the Roman soldier Longinus to pierce the Savor's side. In the following summary, I have tried to give the major plot features but have not attempted to include all the twisting intricacies and convoluted details of this book. In an obscure opening passage, the author appears to respond to his critics (regarding his digressiveness, elliptical writing, etc.) Gahmuret "the Angevin" (eventual father of Parzival), seeks his fortune with knightly deeds after his eldest brother Galoes inherits the kingdom from their father King Gandin of Anjou [in NW France]. He travels to the Baruch in Baghdad and "throughout heathendom". He comes to the kingdom of Zazamanc in North Africa, and through knightly competition (against the relatives and followers of a former suitor Isenhart), wins the kingship of Zazamanc and his bride, the black Moorish queen Belacane. But he soon sneaks away, leaving her pregnant, ostensibly because she is an infidel. Her son Feirefiz is born with black with white spots. He heads for Spain and Seville. Gahmuret visits his cousin (his aunt's son) Kaylet, king of Castile. Gahmuret eventually arrives in Waleis [from "Wales"?] in Spain. Kaylet tells him that the knights assembled include Utepandragun of Briton (father of Arthur; married to Arnive, who has left with a cleric), King Lot of Norway (married to Sangive, daughter of Arnive and Utepandragun; father to young Gawan), Morholt of Ireland [he was later slain by Tristan], Tristan's father Riwalin, etc. By winning a great pre-tournament, he wins the hand of their Queen Herzeloyde at Kanvoleis. He must turn aside the amorous claim by the queen of France, Ampflise. He learns his brother Galoes and his mother have died. With Herzeloyde, he insists on the freedom to participate in one tournament a month. While serving the Baruch in Baghdad, he is slain by Babylonians. Herzeloyde has prophetically dreamed of his death. She gives birth to Parzival and nurses and raises him, keeping him from learning anything about chivalry. In an aside, the author digresses about the woman who has been unfaithful to him, about women in general, and his own calling as a knight. He claims to be illiterate. Author digresses further on womanhood. The grieving and angry Herzeloyde retreats to the forest, shielding Parzival from knightly learning as she lives a joyless life. But one day he meets three Arthurian knights, who are chasing two others including the abductor Meljacanz. The ignorant Parzival mistakes one of the knights for God, and wishes to follow them. They agree for him to seek Arthur's court. Reluctantly, his mother dresses the ignorant simple man as a fool and sends him on with some words of seemingly sage advice on winning a good woman's ring. Parzival promises her that he will seek vengeance on Lehelin, who has taken away some of their domain. Soon after he has left, she dies of grief (he is not aware of this). [Estimates of the passing of time stated below start from this date]. He comes across the sleeping Lady Jeschute of Karnant (wife of Duke Orilus de Lalander and sister of Erec), forcibly but innocently embraces her and robs her of her ring. The husband later arrives and wrongly accuses his wife of infidelity, shaming her. We learn that he is the one who slew Galoes, brother of Gahmuret. Parzival meets his cousin Sigune (daughter of Kyot and Schoysiane) grieving for the death of Schianatulander the Prince (who was fighting in Parzival's service). She tells Parzival his own name and his heritage, that his mother Herzeloyde is Sigune's aunt. She also asks him to seek vengeance against Lehelin and Orilus, who have stolen part of his kingdom and slain her noble Prince. He seeks Arthur, but she misdirects him intentionally. The two stay the night with a churlish fisherman, who the next morning directs them on to Nantes and Arthur's camp. Before arriving, Parzival encounters Ither the Red Knight, a cousin of Arthur who had been brought up by his uncle Utepandragun and who is now challenging Arthur for the kingship. Lady Cunneware (Duchess of Lalant, sister of Duke Orilus), is at Arthur's court--she laughs at Parzival and as a result she is flogged by Arthur's steward the seneschal Keie, along with the fool Antanor (who has prophesied Cunneware's laugh and that Parzival will destroy Keie's joy). Arthur promises to confer knighthood on Parzival the next day. Parzival rides out to challenge Ither and demand his armor--Ither attacks Parzival and Parzival slays him with his javelot [light spear]. Lady Ginover's page Iwanet arrives and helps Parzival put on the Red Knight's armor, refusing to give him back his javelot, saying this weapon is unsuitable for a knight. Ginover laments the knight's death. Meanwhile, Parzival rides away and encounters Gurnemanz de Graharz at his castle. The kindly host has comely maidens bathe the handsome Parzival and tend to his wounds. Gurnemanz teaches him how to make the sign of the Cross and other holy actions, and counsels him on how to behave more maturely and how to act as a Christian, etc. He also tells him "do not ask too many questions". He extols marriage and offers his daughter Liaze in marriage to Parzival. During the 14 day visit, Parzival undergoes more knightly training. Gurnemanz's sister's daughter Condwiramurs has refused to marry Clamidê (or Clamide, King of Iserterre and Brandigan), who has besieged her. Gurnemanz mourns the deaths of his 3 sons. Parzival promises to ask for Liaze's hand if he is ever worthy, and departs. Parzival is now more knightly. He arrives in Brobarz and the city of Pelrapeire. There he meets Condwiramurs (daughter of her deceased father Tampenteire, and niece of Kyot the father of Sigune). Her beauty excels over Liaze. She comes to his bedroom during the night to seek his support, kneels before him, and chastely enters his bed. She begs him to spare her from marrying Clamide, threatens to kill herself rather than being forced into this marriage. He fights and defeats Kingrun and later King Clamide, and wins the hand of Condwiramurs, thus becoming a king. He sends Clamide and his defeated seneschal Kingrun to serve Arthur, and to ask Cunneware to forgive Parzival for the flogging she received after laughing at him. Meanwhile, Parzival [after 15 months--in September or October] asks leave of his queen and wife to go and find out how his mother is doing, and also to seek adventure. Parzival arrives at a lake (Brumbane) and sees men in a boat who appear to be fishing. Anfortas [Wagner: Amfortas] the "fisher king" invites him to his nearby magical castle, Munsalvaesche in Terre de Salvaesche. There, he is hosted bounteously by Anfortas and his sister, queen Repanse de Schoye. Anfortas is son of the deceased King Frimutel and the brother of Herzeloyde. The knights are all sad. They dine in a great hall. Anfortas is brought in and lays ill on a cot and it is said "his life was but a dying". A squire comes in bearing a lance/spear--blood issues from the point and runs down the shaft--the knights all weep [it is Anfortas' blood]. The Queen enters bearing the Grail--it is a clear stone of "garnet hyacinth"--and places it before Anfortas. It is like the perfection of paradise ("wunsch"), and she who watches over it must preserve her purity and renounce all falsity. A splendid meal ensues. The Grail magically provides food and drink (as well as eternal life) in its presence. Unfortunately, the simple Parzival fails to ask about Anfortas's illness, dumbly recalling Gurnemanz's advice not to ask too many questions, thereby preventing Anfortas from receiving the healing he so longs for. Anfortas gives a sword to Parzival that he used to carry in battle. The queen carries out the Grail. Parzival sees the elderly Titurel in another room (he is Anfortas's grandfather and Parzival's great grandfather). They retire and Parzival has a troubled night. The next morning, he discovers the king and all his court have left--a lone squire remains to chastise him for failing to ask the host the all-important question. The tracks of those who had departed become fainter and disappear at last. Parzival again encounters the disheveled Sigune still lamenting her dead Prince--she is embracing his embalmed corpse! He tells her where he spent the night. She advises him that the castle he stayed in, Munsalvaesche, cannot be found intentionally but must be chanced upon [by those considered worthy of the Grail.] Titurel had bequeathed it to his son Frimutel, who had four children: Trevrizent the monk, Anfortas, Sigune's mother Schoysiane, and Herzeloyde. Parzival now is wearing a magic sword made by the famous smith Trebuchet, given him by Anfortas. She chastises him that he did not ask the proper question, and he is deeply remorseful. Riding on, he encounters the tattered and nearly naked Lady Jeschute, and through jousting restores her to the jealous Duke Orilus. Orilus, at Parzival's demand, agrees to take her back though not convinced of her innocence. They pledge to go to Arthur's camp where Orilus is to serve his sister Lady Cunneware. However, the three first ride to see the hermit Trevrizent's cave, where Parzival swears that he did nothing amiss with Lady Jeschute during the earlier compromising encounter (in Book 3). Orilus is won over and again pledges his love to his wife Jeschute. The two travel to Arthur's camp and meet with Lady Cunneware. Orilus tells of his defeat by the "Red Knight". Arthur speaks of Jeschute's father Lac, King of Karnant. Arthur has ridden from his castle at Karidoel. He is in search of the new "Red Knight" (Parzival), who has spared him from Ither, in order to make him one of his knights. It is a snow May day. Parzival, on a field at Joflanze next to the Plimizoel river, sees blood drops in the pure white snow (from a goose attacked by Arthur's falcon), and is reminded by it of his beloved Condwiramurs. A squire from Cunneware encounters him and raises a cry. The reckless Segramors comes out and fights him but loses. Parzival is still lost in thoughts of love. The author apostrophizes Lady Love (Minne). Subsequently Keie challenges him but also loses the fight. The author alludes to his patron Herman, the Landgrave of Thuringia, and to the poet and Minnesinger Walther von der Vogelweide, and praises Keie. Gawan rides out, covers up the drops of blood to allow Parzival to recover his wits, and escorts Parzival to Arthur's camp, telling him of Gawan's father Lot, etc. Parzival is the Waleis, "the flower of all men", still beardless and radiant with beauty. Cunneware welcomes him, appreciating that Parzival has avenged the wrong that Keie did to her. Parzival is cleaned up and dressed, meets Arthur, and is made a knight of the Round Table. Ginover joins them, and forgives Parzival for killing Ither. Cundrie the sorceress (la sorcière) arrives on a mule--she knows many languages including Arabic, has a nose like a dog, braided eyebrows, a hairy face, etc... She chastises Parzival for not asking Anfortas about his suffering. She speaks of Feirefiz (Gahmuret's son and Parzival's half-brother), and of Parzival's mother Herzeloyde. She tells of the 400 queens and maidens held captive at the Castle of Wonders and who are awaiting being rescued and won. She departs lamenting about Munsalvaesche. The knight Kingrimursel (Landgrave of Schanpfanzun, brother of Kingrisin the King of Ascalun), rides up and challenges Gawan because Gawan has killed his kinsman [possibly his brother Kingrisin--the exact relationship is confusing]. Clamide laments losing Condwiramurs and is given Cunneware to marry. Gawan and Kingrimursel make plans to fight before the King of Ascalun in Schanpfanzun. Beacurs, Gawan's brother, will be the surety for the fight. Parzival laments his failure to help Anfortas, and renounces his service to God, resolving to seek the Grail. He sets out on his quest. Meanwhile, Arthur's court sets out to find the Castle of Wonders Cundrie has described. The Greek Clias speaks of the four queens held there against their will: Arnive (Gawan's grandmother; Arthur's mother; married to Utepandragun), Sangive (Arnive and Utepandragun's daughter, mother of Gawan), Itonje (Gawan's sister), and Cundrie (also Gawan's sister; not the same as Cundrie la sorcière). Arthur's party breaks up. Gawan meets Lippaut, Obie, Obilot, Meljanz, etc. Gawan rides off to fight on his horse Gringuljete. He passes the army of King Poydiconjunz and Duke Astor (of Lanverunz) and speaks to a squire. Poydiconjunz's son Meljacanz seeks a knightly combat. Behind Gawan follows the army of King Meljanz of Liz (he is the son of Poydiconjunz's brother Schaut, and is not the same person as Meljacanz). Meljanz had been cared for as a youth by Prince Lippaut after his father's death, and is seeking Lippaut's daughter, Obie, as his bride. But she has refused him (out of foolish arrogance and pride), and he blames Lippaut. Gawan arrives at the castle of Duke Lippaut. Lippaut's brother is riding to help Lippaut. Obie rudely taunts Gawan as if he were a merchant, and this provokes him. Scherules, the burgrave of the city welcomes Gawan, and defends him to Lippaut against the taunting accusations of Obie. Obie and Meljanz are said to love each other--though this is not obvious at the moment. Lippaut asks Gawan to help him, but Gawan is undecided. With her father's encouragement, Gawan meets Lippaut's younger daughter Obilot, who has been playing with her friend Clauditte. She is affectionate with Gawan and pledges to give her love to him. Gawan says his loyalty is already pledged (to who?) and that she would need to be 5 years older for him to give her his love. But he is persuaded by her charms and promises to bear arms in her honor, and she promises to protect him. Lippaut responds to Obilot's request and asks his wife the duchess to have a fine new dress made for Obilot--one of the sleeves is given to Gawan, and he nails it to his shield... Fighting and jousting. Gawan fights Lisavander who is unhorsed, as are others. Gawan does not want to fight against Arthur's knights who are present. A nameless knight in red (Parzival) has joined Meljanz and excels in the fighting... Meljacanz is defeated and Meljanz has been wounded (by Gawan) and captured. Gawan returns the sleeve to Obilot, and defends Lippaut to the king, Meljanz. He realizes Parzival had been fighting there--both knights have been there incognito. Gawan praises Obilot and asks of Meljanz his pledge of security for her. Meljanz is reconciled with Lippaut's wife and with Obilot, and Gawan gives the child an affectionate hug. Obilot predicts Meljanz will have Obie as his amie, the two lovers are reconciled, and eventually marry. Gawan departs, refusing the affectionate Obilot's plea to take her with him. Gawan arrives in Ascalun seeking the town of Schanpfanzun. He arrives at a great castle and meets King Vergulaht (who is a first cousin to Parzival; the son of Flurdamurs the sister of Gahmuret). The king sends Gawan to meet Antikonie, his maiden sister. They immediately lust for each other, but are interrupted by a white knight who forces him to defend himself. He flees with the maiden to the tower and she helps defend him by throwing chess pieces. King Vergulaht arrives and shamefully prepares to join in the fight against Gawan, believing Gawan killed his kinsman [possibly his brother Kingrisin]. Kingrimursel arrives, is distressed that his assurance of Gawan's safety until the scheduled day of their single combat has been violated, and defends Gawan against King Vergulaht. (Kingrimursel is either King Vergulaht's father's brother's son--i.e., Vergulaht's cousin [p. 222]--or King Vergulaht's father's brother--i.e., Vergulaht's uncle [p. 441]). They chastise king Vergulaht. The author described Kyot the Provençal and "le chanteur" from whom he claims to have obtained the story. Kingrimursel asks Gawan for a joust in one year at Barbigoel before King Meljanz. Vergulaht forgives Gawan provided he will seek the Grail for him. Gawan agrees and departs to begin his quest for the Grail. The author begins with an aside to Lady Adventure, asking what has become of Parzival. Parzival has traveled and wandered widely by horse and by sea, lamenting his lack of success in finding Anfortas. About four and one-half years have elapsed since he left his wife. The sword Anfortas gave him has helped him to avoid defeat in combat, though it required repair in the spring of Karnant. He again encounters his cousin Sigune, now a hermitess devoted to God, her dead hero now buried but still lamented. She is nourished by food coming from the Grail provided by Cundrie la sorcière [Munsalvaesche is nearby]. They finally recognize each other. She advises him to seek Cundrie la sorcière, who has just ridden away, but he does not find her. He jousts with and defeats a knight templar from Munsalvaesche defending his lord's forest, loses his horse into a chasm, and takes the knight's horse and rides away. Weeks later, it is now a snowy Good Friday, perhaps in March. Parzival is bitter at having been abandoned by God. But his interest in the Creator and Christianity is rekindled or awakened by an old knight Gabenis accompanied by his wife and daughters on a pilgrimage--he advises him to seek penance with the holy hermit Trevrizent. Parzival allows his horse to guide the way, and soon he finds Trevrizent at Fontane la Salvatsche. The author relates more about the Grail as told by Kyot. 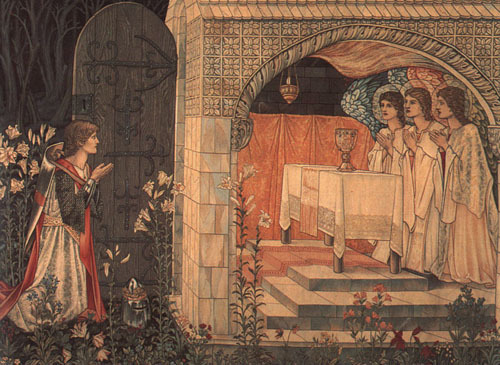 A heathen named Flegatanis wrote the adventure of the Grail. The Grail was left on earth by a host of angels, and since then baptized men have had the task of guarding it. Titurel and Frimutel had bequeathed it to Anfortas. Trevrizent fears no man, was once a knight himself. Parzival at last recognizes the hermit from the casket on which he had previously given his oath exonerating Lady Jeschute four and a half years earlier. Parzival laments his joyless life and heavy burden, his hatred for God. Trevrizent advises him to place his faith in God and in Christ. He tells of Cain's murder of Abel, of how Cain robbed mother earth (Cain's grandmother) of her virginity, and of Jesus' purity. Parzival must atone for his sins. He recounts how Plato and the Sibyl had foretold the redemption to come. God shares His love and His hatred with mankind. Parzival says he grieves to find the Grail and his wife. Trevrizent tells how no man can find the Grail unless he is called by it. Parzival does not admit he has already been there. Trevrizent tells how the Grail provides sustenance to the knights at Munsalvaesche. It is called the lapsit exillis [possibly a corruption of "lapis lapsus ex caelis", "a stone falling from heaven"]. No human, no matter how ill, can die within the week after viewing the stone, nor will his looks ever fade in its presence, other than his hair turning grey. A white dove descends on Good Friday each year, bringing a wafer to the Grail--this imparts its life-sustaining properties. On the edge of the stone Grail appear letters from time to time, naming the men who are to become the knights of the Grail--inscriptions that then magically fade away. The knights come from many lands. Trevrizent cautions Parzival against excessive pride. Trevrizent tells how Anfortas was wounded while jousting because of "his desire for love beyond all restraints and bounds"--knights must guard themselves against incontinence. (The woman was apparently Orgeluse--Book 12). Only one person has come to Munsalvaesche unbidden--"a foolish man who took sin away with him" but who did not ask about Anfortas' suffering. That man must atone for his sin. Trevrizent asks Parzival who he is, whether he is Lehelin (since he has recognized on his horse's saddle the turtledove emblem of the Grail). Parzival says he is the son of Gahmuret, admits to despoiling the corpse of the Red Knight Ither. Trevrizent now recognizes him as the son of his sister, and chastises him for slaying his own kinsman Ither. Moreover, he tells Parzival that his mother Herzeloyde died because of grief for him soon after his departure from her. Trevrizent had two other sisters: the deceased Schoysiane (married to Kyot and mother of Sigune) and the maiden Repanse de Schoye, who tends the Grail. Anfortas, his brother, seeks an end to his suffering. When Frimutel died, Anfortas was chosen as his successor as Lord of the Grail. But Anfortas craved love, even though any love craved by the Lord of the Grail, other than that written on the Grail, is forbidden. He chose a lady to fight in service for--"Amor was his battle cry". He was subsequently struck with a poisoned spear during a joust with a heathen, pierced through the testicles and with an iron spear head remaining embedded in his flesh (the heathen was killed). Trevrizent made a vow to serve God and renounce worldly pleasures if He would help his brother. The Grail prevented Anfortas from dying, but the wound festered, and God denied his aid. Nothing could be found to help him, not even the bough the Sibyl had provided Aeneas, the blood of the pelican, the unicorn's heart, or trachonte (dragon-wort). While praying to the Grail, inscriptions appeared on it prophesying that a knight would come whose unprompted question would bring an end to Anfortas's suffering, and that he would then become king. The knight had come but shamefully failed to ask the question. Parzival partakes of the hermit's meager fare, and confesses finally that he was the one who had so shamefully acted at Munsalvaesche. Trevrizent asks if he saw the spear--is is necessary for it to be held over or thrust into Anfortas's wound on occasion. Anfortas cannot walk or ride, lie or stand. He bathes in the lake Brumbane, from which the rumor has arisen that he is a fisherman. Parzival recounts his visit to Munsalvaesche, of the 25 maidens caring for the Grail that he saw there, etc. Trevrizent says the maidens may leave the castle openly and freely, but the men are pledged to serve the Grail and all but the lord of the Grail (Anfortas) must renounce the love of women. Trevrizent had violated his pledge and fought in service to a woman. He recounts his great wanderings, recalls meeting Gahmuret, who gave him the stone in the casket... Parzival must atone for his sins. Parzival stays for 15 days [departing probably in early April]. He asks about Titurel, the first to be entrusted with the Grail, a man who cannot die because he sees the Grail constantly. Trevrizent tells Parzival he must serve God and never mistreat women or priests, and at last they part company. A year has passed, the joust between Gawan and Kingrimursel has been canceled, and both Gawan and King Vergulaht are seeking the Grail. Gawan nears Logrois. He encounters a warrior-like maiden tending an injured knight (Urians Prince from Punturtois), and treats him with an improvised chest tube made of tree bark. The knight has been injured by fighting Lischois Gwelljus (Duke of Gowerzin). He rides on to Logrois. There he meets the lovely Duchess Orgeluse de Logrois, "the very bait of love." But she is sharp tongued, bad tempered, and contemptuous. He is smitten by the warlike and ill-behaved woman and wishes to serve her, but she warns him that he will rue association with her later with shame. She will tolerate no cowards. He meets several of the townspeople while fetching her horse, and they also warn him about her, who has caused so many men to lose their lives. The squire Malcreatiure, dwarf and brother of Cundrie la sorcière, arrives. Queen Secundille of India (Tribalibot), wife of Feirefiz, had sent her subjects Malcreatiure and Cundrie la sorcière with jewels as well as more intangible gifts (?) for Anfortas, and Anfortas had given Malcreatiure to Orgeluse. Malcreatiure tells Gawan he is a fool, and Gawan throws him around, cutting his own hand. They arrive back at the wounded knight Urians, whom Gawan tends. The knight says it was Orgeluse who led to his injury, and warns Gawan away from her. Then Urians steals Gawan's horse! Orgeluse mocks Gawan. Urians returns, and alludes to a previous combat with Gawan and his ill treatment by King Arthur, then rides away again. Gawan recounts his past encounter with Urians: Gawan had brought him back a prisoner to Arthur after Urians raped a maiden in a forest. The court decided on his execution, but Gawan pleaded successfully for the man's life. Urians was forced to eat at a trough with dogs as his punishment. Gawan decides against riding the nag provided by Malcreatiure, and is scorned by Orgeluse, but he is blinded by love. She takes a ferry across the river, leaving Gawan behind. Gawan next jousts with Lischois Gwelljus, wins, spares his life, and discovers that Lischois is riding Gawan's horse Gringuljete, the one stolen by Urians. It bears a mark of the Grail, and he had been given the horse by Orilus. Lischois starts another fight, wants to die, still loves Orgeluse--but Gawan again spares him. The ferryman Plippalinot tries to lay claim to Gawan's horse, but Gawan offers instead the nag and Lischois. Plippalinot says Clinschor is lord in this "land of fantastic adventure" (into which they have crossed by ferry), and invites him and Lischois to his home. His daughter Bene and his son receive them hospitably, and Gawan asks to have Bene dine with him--later he is left alone with the shy and comely girl but does not take advantage of her. Gawan awakens in the morning and sees through the window the castle of Clinschor--inside are enchanted ladies who never seem to sleep. When he asks about them, Plippalinot and Bene are terrified of it and say there is great misery there--"all the ladies there held hostage and brought here by mighty enchantment." Gawan is in the Land of Wonders. Plippalinot hopes Gawan can free them. He recounts that yesterday he ferried Parzival across the same river, searching for the Grail. Bene dresses him in his armor, and the host gives him a strong shield. He instructs Gawan on how to approach the Castle of Wonders. Gawan approaches the castle, and as instructed leaves his horse with a trader with an outside stall--it is full of rich exotic goods. The trader tells him all will be Gawan's if he is successful and survives. In the hall, he enters the chamber with the Wonder Bed ("Lit marveile"), where he is attacked by stones that are slung, arrows, and a lion. Badly wounded, he falls unconscious, and is tended by maidens sent by Arnive. The wise old queen Arnive supervises and provides herbs to him to induce sleep and the same salve used to aid Anfortas (which she has received from Cundrie la sorcière). Gawan yearns for Orgeluse. Gawan still pines for Orgeluse while recuperating in the castle--Lady Love is displaying her anger. Others of his kin have also suffered because of love: Parzival, Galoes, Gahmuret, Itonje (Gawan's sister), etc. He dresses and explores the castle. He meets Arnive and her daughter Sangive and Sangive's two daughters Itonje and Cundrie (his sisters). In a magic pillar (stolen from Queen Secundille in the land of Feirefiz), one can see images from the country up to 6 miles away. He sees the image of Orgeluse approaching with a knight, the Turkoite (Florant of Itolac). The jealous but still wounded Gawan rushes out, is ferried to the far shore, and jousts and defeats the Turkoite. He sends the Turkoite off to the castle. But Orgeluse thumbs her nose at him, saying she will grant her love to him only if he fetches a wreath from the branch of a tree guarded by King Gramoflanz and located in Clinschor's forest. He rides off to comply. He tries to leap a ravine of the Sabins river, but his horse falls in and drifts away. Retrieving the horse, he succeeds finally in fetching the branch. Gramoflanz, son of King Irot, arrives carrying a falcon given to him by Itonje, and refuses to fight Gawan. He explains that Orgeluse spurned him after he killed her husband Cidegast and kept her prisoner, trying to get her to agree to marry him. But now he loves the daughter of King Lot, Itonje, whom he has never seen, and wants Gawan to help him win her for him--he gives Gawan a ring to take to her. Gramoflanz wants to avenge the slaying of his father King Irot by King Lot (Gawan's father). Gawan discloses to him his identity and defends his father. They agree to meet for a joust on the plain of Joflanze (near the Plimizoel river) in 16 days. Gawan successfully leaps back across the ravine with the wreath. He presents the wreath to Orgeluse but chastises her for her mockery. She says she only wanted to test him and promises him her favors when he is out of armor at the Castle of Wonder. Orgeluse tells her story: She had greatly loved Cidegast and had chosen Anfortas to avenge her by killing Gramoflanz. But Anfortas is wounded in her service, and the rich gifts Anfortas intended for her she gave instead to Clinschor to appease him (since she suspected he had something to do with Anfortas's wounding). All present had agreed that if any man wins her treasure (from Clinschor), she would seek his love--she had hoped to lure Gramoflanz to his death with the treasure. Other knights also served her for love, but only Parzival refused serving her in this way. Gawan asks her not to give out his name, and they return to the Castle of Wonders. On the ferry, the Duchess sees Gawan's face for the first time. She arranges to free Lischois from the ferryman (for a price) and also asks to have the Turkoite freed. They are welcomed warmly at the castle. Gawan sends secret word to Arthur about the upcoming joust with Gramoflanz at Joflanze, and asks that they bring a retinue to assemble there. Gawan's identity remains unknown at the castle. Gawan invites Lischois and Florant to the castle and sets them free to honor Orgulese's request--they are dressed in rich garments. The four queens arrive: Arnive, Sangive, Cundrie, and Itonje. After learning which one is Itonje [apparently he does not already know her], and without acknowledging to her that he is her brother, he tells the young and sheltered Itonje of Gramoflanz's love for her and gives her the ring. She accepts the ring and says her heart strives toward Gramoflanz. Itonje feels imprisoned as an exile from her land--otherwise she could have long ago granted her love to him. She knows Orgeluse wants him killed. She is also unhappy about Lischois and Florant, who are after Gramoflanz. Gawan does not tell her she is his sister. A nice dinner ensues and much gaiety--the ladies and the men in the castle had never met before (?) since Clinschor has control over them all. Gawan and Orgeluse retire to a night of sweet delight--the healing herb of love comforts him and relieves his pain. Meanwhile, the squire sent by Gawan arrives at Queen Ginover's chapel and transmits the request to her. Ginover promises her ladies will attend at his joust with Gramoflanz at Joflanze, and sadly recalls how the power of the Table Round was broken when Parzival left, etc. She gives the squire secret instructions on how to rush into Arthur's company as if just arriving, and to appeal to him on behalf of Gawan. Arthur is incensed that his kinsman Gramoflanz wants to fight his own kinsman Gawan, and decides to take his retinue as requested on the journey to Joflanze. The squire returns to Gawan with the news, and Gawan is relieved. Gawan asks Arnive how Clinschor had acquired his magic powers. She tells how Clinschor was descended from Virgil of Naples, how he was castrated ("made smooth between his legs") for bedding Iblis, the wife of Sicily's King Ibert, how he learned magic in Persida, how he bought his castle from King Irot, and how he bore good will toward no one. The castle and the lands now belong to Gawan, according to Clinschor's pledge. Arnive hopes he will relieve her relief by freeing her and the others from their imprisonment. Arthur's followers arrive across the river in the nearby countryside, and Gawan conceals who they are. He sends word through Bene to prevent them from crossing the river. The duchess cannot tell who they are. Arthur has been wounded near Logrois by the duchess's followers, because the duchess did not know to grant them safe passage. Gawan at last tells who he is and that the army belongs to Arthur. He rides out with the women to meet Arthur and they are warmly received. Gawan introduces his mother, grandmother, and sisters, as well as the Duchess. Later, the Duchess's army arrives to help them. Arthur sends word to Gramoflanz to try to persuade him against fighting his own kinsman. Gawan prepares for fighting, rides off and encounters a knight by the river (Parzival). Gawan, thinking his opponent is Gramoflanz, jousts with Parzival. Gramoflanz arrives with a large host and wants to joust the next day. Arthur's messengers try to dissuade Gramoflanz from the fight. Bene has brought a ring sent by Itonje to Gramoflanz as a token of her love, and reminds him of Itonje's distress. Gramoflanz arms himself for the joust. Parzival learns from arriving squires of Gawan's identity, and stops fighting before achieving final victory, regretting that he has been fighting Gawan. He introduces himself to Gawan. Gramoflanz rides up and asks to fight Gawan tomorrow when he is recovered. Parzival offers to defend Gawan, but Gramoflanz declines. Bene is angry with Gramoflanz because he insists on doing battle even though, as she now realizes, Gawan is brother to Itonje her lady. Parzival joins and is recognized by Arthur's army. Gawan introduces Parzival to the four queens and reintroduces him to the duchess Orgeluse (whom he had previously spurned)--they dine. Bene is weeping from her concealed love for Gawan. Later Arthur and Ginover join them, and all praise Parzival. It is a gathering of men from the armies of Clinschor, the duchess, and Arthur. Parzival expresses his desire to return to the Table Round of Arthur and is accepted. Parzival asks Gawan to allow him to fight Gramoflanz instead of Gawan, but Gawan refuses. Gramoflanz secretly comes looking for the fight, and Parzival steals secretly out to meet him. They fight, with Parzival the stronger fighter, and Gramoflanz concedes defeat. Gawan offers to fight him the next day. Arthur chastises Parzival for entering the fight by stealth. The fight is planned for the next day. Itonje laments her brother will be fighting with her lover. Arnive advises Arthur to prevent the fight. Arthur questions Itonje, who says she and Gramoflanz love each other sight unseen. Two squires from Gramoflanz slip a ring and letter for Itonje to Bene, and ask to speak to Arthur. Arthur reads the love letter from Gramoflanz to Itonje, and is convinced of their mutual love and that there is no deception intended. He resolves to prevent the battle. He wonders how they came to love each other, and Itonje says it was Bene's doing. The squires tell Arthur that Gramoflanz wants to fight only Gawan. Arthur treats them hospitably and makes plans for dealing with Gramoflanz the following day. Arthur sends out his sister's son Beacurs to meet Gramoflanz--he escorts him back. Gramoflanz arrives and, searching for one who resembles Beacurs, identifies Itonje and kisses her. Arthur confers in private with King Brandelidelin of Punturtois (Gramoflanz's uncle) about the intention of their respective nephews to kill each other--would not this win the hatred of Itonje? They agree and Brandelidelin asks Arthur to have Itonje dissuade Gramoflanz. Also, the duchess Orgeluse has received consolation for Cidegast's death in Gawan and agrees to reconcile with Gramoflanz if Gawan will renounce the battle. Finally, Gawan and Gramoflanz agree to the reconciliation, Arthur gives Itonje to Gramoflanz, Cundrie (Gawan's sister) is given to Lischois, and Florant receives Sangive (former wife of Lot) from Arthur. A sumptuous marriage festival ensues. But Parzival is thinking of his faithful love for Condwiramurs, and leaves at dawn. Parzival encounters and fights a rich heathen, not realizing it is his half-brother Feirefiz (who is in quest of love and fame). He was leading 25 armies of Moors and Saracens. On his helmet he wears an ecidemon given to him by Queen Secundille (his wife in India). We learn the Condwiramurs has had two sons by Parzival, Kardeiz and Loherangrin (Wagner: Lohengrin). Thinking of his wife for inspiration, Parzival defeats Feirefiz. Feirefiz introduces himself as Feirefiz the Angevin, and they are soon delighted to realize that they are brothers. He is black and white in complexion. Feirefiz tells of his mother Belacane (neither son ever saw his father) and of Gahmuret's death in Baghdad in a joust. Parzival persuades the spotted man to ride back with him to Arthur's camp to meet the beautiful women there, etc. Jofreit son of Idoel announces the plans to have a feast, and Clinschor's knights and ladies join in. Arthur arrives, and after Feirefiz tells of his mission, Arthur tells Feirefiz of Parzival's quest for the Grail. Feirefiz and Parzival catalog some of the men they lead or have fought in the past. The gathering examines Feirefiz's richly jeweled battle equipment. Later, Arthur grants membership in the Round Table to Gramoflanz, Florant, and Lischois Gwelljus, and the feast begins. Cundrie la sorcière rides up, now sumptuously dressed in garments bearing the Grail emblem, and falling at his feet weeping announces to Parzival he is to be lord of the Grail and blesses him. Condwiramurs will join him, and she also tells him of his two sons. He chooses Feirefiz to be his companion and the two plus Cundrie la sorcière ride to return to the Grail. [It is c. May.] Anfortas is kept alive by the Grail against his will and in great suffering--his knights will not have pity on his distress because of the inscription that had appeared on the Grail predicting eventual relief by a second coming of Parzival. Anfortas repeatedly screams, and the stench of his wound must be ventilated from the room. He is treated with a variety of exotic remedies. Parzival arrives in Terre de Salvaesche guided by Cundrie la sorcière. The templars receive him with joy and take the party to Munsalvaesche and the great hall. Anfortas begs them to arrange for him to die. Parzival asks "Uncle, what is it that troubles you? ", the essential question that heals Anfortas with the Lord's help. He emerges from his sickness and Parzival is declared the new Lord of the Grail and King. Condwiramurs rides to Munsalvaesche, guided by Duke Kyot and others, while Parzival rides out to see Trevrizent. After meeting with Trevrizent, he rides on to meet his wife. Parzival arrives to find his wife asleep in bed with her sons--Parzival has been faithful to her all this time, and he spends the morning with her. His son Kardeiz is crowned king of Waleis, Norgals [from North Wales? ], etc. They eat by the bank of the Plimizoel river. Parzival asks about the hermitage where Sigune was living, and riding there he finds Sigune dead. He has her buried in the same coffin that holds the body of her beloved Schianatulander. They return to Munsalvaesche. Loherangrin is afraid of Feirefiz. Feirefiz meets Repanse and falls in love with her, forgetting Secundille. The Grail is brought forth, carried by Repanse. Feirefiz cannot see the Grail, says Titurel, since it cannot be seen by a heathen. Feirefiz agrees to baptism if it will help him in love, and he agrees to renounce Jupiter and also Queen Secundille--afterwards he can immediately see the Grail. Writings appear on the Grail, stating that any templar whose name is asked by a foreign people that he is aiding should help them no longer. Anfortas is ready to renounce wealth and the love of women, and refuses to leave with Feirefiz. In 12 days, Feirefiz departs with Repanse his wife and Anfortas escorts him for a while on his journey back to Joflanze. There he finds that Arthur has returned to Camelot (Schamilot). He eventually rejoins his army and learns from Cundrie la sorcière that Queen Secundille has died (Anfortas is relieved eventually to hear this). Feirefiz returns with Repanse to India--she gives birth there to Prester John and Feirefiz spreads the word about Christianity. Anfortas lives out his years jousting for the Grail but not fighting for women. The story of Loherangrin is briefly recounted: He weds the princess of Brabant at Antwerp after being brought by a swan. He tells her never to ask his name. But she eventually breaks her pledge out of love, and though they have had children together, he must depart. The swan brings him a little boat and he reluctantly returns to the Grail. Kyot has furnished the right version of the story, not Chrétien de Troyes. Parzival has ended in the blessed place for which he was intended. The author closes "To good women, if they are sensible, I am all the more worthy--in case one of them wishes me well--now that I have completed this story. If it was done for a woman's sake, she will have to speak sweet words to me."